Doujinshi-Ka’s Inbox: What are Schrödinger and Rip? Doujinshi-Ka’s Inbox: What are Schrödinger and Rip? published on 7 November 2004 Read more posts by the author of Doujinshi-Ka’s Inbox: What are Schrödinger and Rip?, Erin PtahNo Comments on Doujinshi-Ka’s Inbox: What are Schrödinger and Rip? After I posted this, Lorena pointed out that there are werecats in mythology. Jan McNeville discussed a type of cat demon (the aku-sambiki) in Japanese mythology which could take on human form – but retained its ears. And later, Word Of God came out to say that Schrödinger is a catboy, created by Doc. Erin: For those of you not that far in the Manga, these two are Rip and Schrödinger, two of the Millennium Nazis – chibified for convenience (and maximum cuteness). Disclaimer: Real Nazis are never cute. That’s pretty obvious. This isn’t trying to offend anyone… except maybe Nazis. There’s been some confusion over her being a werewolf – Mr. Mitts explained this in all of its confusing detail, but I’ll just try to summarize. There’s a German term, “Wehrwolf,” meaning “defense wolf.” It’s been long associated with irregular warfare in Germany. A division of Nazis in that business (they sniped, poisoned food stocks, poured sand in petrol tanks, etc.) preferred the spelling “Werwolf” – the equivalent of the English “werewolf” (“lycanthrope”). Rip’s job is a descendant of the job of this division. Thus, Werwolf (“werewolf”) is her rank, but not her species. Schrödinger’s also a Werwolf, but his species we’re not sure of. Evidence suggests that he’s the male version of an old anime standard – the catgirl. His name, after all, is that of Erwin Schrödinger, a quantum physicist most famous for his experiment involving a cat. Sounds fitting in this series, doesn’t it. Besides, he acts like you’d expect a catboy to. 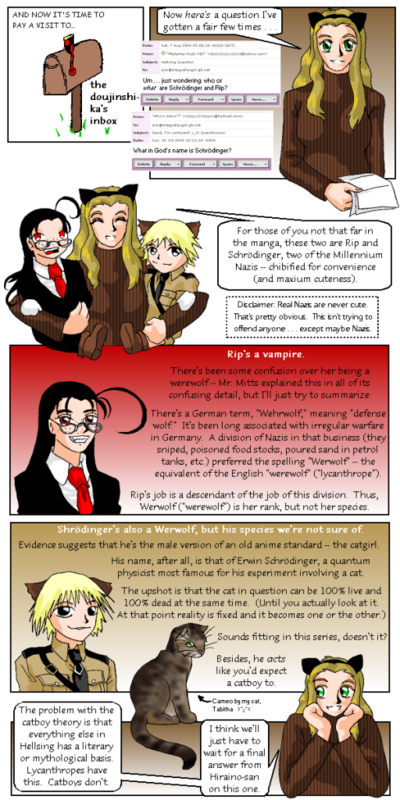 Erin: The problem with the catboy theory is that everything else in Hellsing has a literary or mythological basis. Lycanthropes have this. Catboys don’t. I think we’ll just have to wait for a final answer from Hiraino-san on this one.